1.) The Stars and Blackhawks are meeting for the third time this season and second time at the United Center. Dallas is 2-0 against Chicago this season. 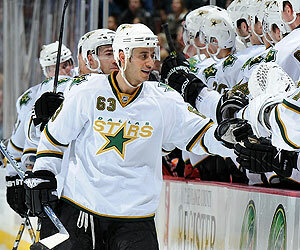 The Stars picked up a 4-3 win at the "Madhouse on Madison" Oct. 17 and grabbed a 5-4 win in Dallas Dec. 29. Alex Auld and Marty Turco have each collected a win while 18 different Stars have tallied at least one point in the season series. 2.) Dallas is coming off of a dominating 4-0 win against the Phoenix Coyotes on Saturday. Marty Turco stopped all 34 shots he faced for his third shutout of the season, while James Neal and Loui Eriksson each notched a goal for the Stars. Rookie Jamie Benn had his best game of his young career, scoring two goals, firing off seven shots and going a remarkable 7-1 in the faceoff circle against the Coyotes. Benn has five points (4g, 1a) in his last five games. He is fourth in rookie goals (13), eighth in rookie assists (14) and sixth in rookie points (27) through 58 games. 3.) Mike Ribeiro will be returning to the ice tonight for the first time in five weeks. "I know he's very excited about coming back into the fold," said coach Marc Crawford. "It's been five weeks since the injury, so we feel pretty good that he's pushed as hard as he has to get himself back into a position where he can help us as we get closer to a playoff spot." Ribeiro suffered a throat contusion against the New York Rangers Jan. 6 and required a surgery and an emergency tracheotomy. He was not expected to return until after the Olympic break. Ribeiro has skated in 43 contests so far this season, collecting 33 points (10g, 23a). He has 3 points (2g, 1a) in the season series. 4.) Mike Modano leads all Stars in goals (36), assists (51), points (87) and penalty minutes (62) through 95 career games against the Blackhawks. He has one goal in one game against Chicago this year. Modano has been very productive offensively lately, registering nine points (7g, 2a) in his last 11 games this season. Marty Turco is 15-5-1 lifetime against the Blackhawks with a 2.18 goals-against-average and three shutouts through 23 contests against Chicago. After sitting out the last three games January, Turco has regained his form posting a 2-1 record in his last three starts. He has stopped 98 of 101 shots (97%) and posted a 1.01 goals-against-average in those contests. 5.) One to watch for: Right wing Patrick Kane has been a steady offensive force for the Blackhawks this season. Kane is currently 11th in the league in scoring with 62 points (22g, 40a) through 58 games. He has scored two goals against the Stars this season and has collected 13 points (7g, 6a) in 10 career games against Dallas. The 21-year-old will make his Olympic debut next week suiting up for Team USA.